Poster Design by Nate Pyper. Celebrate with an evening of music performances, food, and art at ICA. 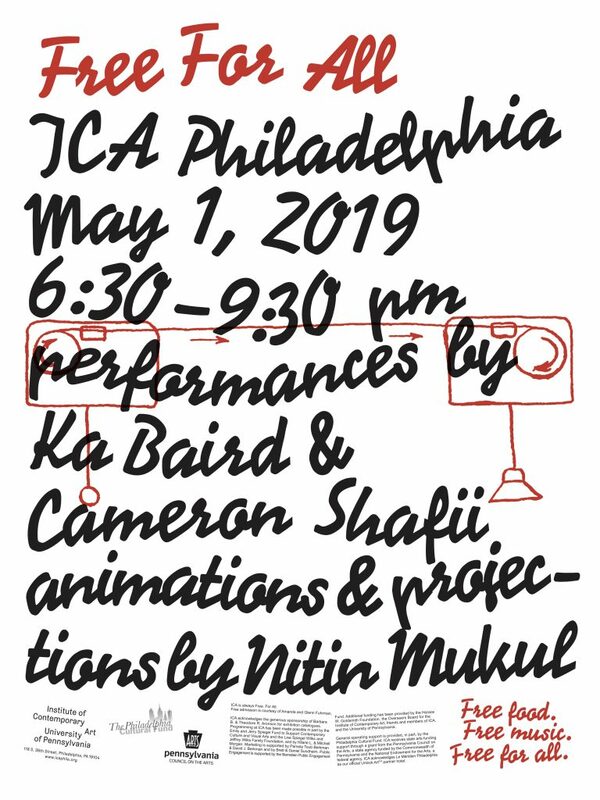 Experimental musicians Ka Baird and Cameron Shafii will perform in a specially designed environment with animations and projects by artist Nitin Mukul. Inspired by the immersive sound and light environments of the 1960s downtown New York scene, the ICA will transform into a space for collective transcendence. Enjoy free snacks and beverages at the museum and participate in free Risograph printing courtesy of Common Press. ICA galleries will be open late to view the exhibitions Introducing Tony Conrad: A Retrospective, Deborah Anzinger: An Unlikely Birth, and Colored People Time: Quotidian Pasts. ICA’s biannual Free For All programs invite students and community members to experience ICA after hours and enjoy free snacks, drinks, music, and performances. This event is free and open to the public. KA BAIRD is a multi-instrumentalist and vocalist living and working in New York City. She is one of the founding and continuing members of the long running avant psych project Spires That In The Sunset Rise. Her work explores piano improvisation, electroacoustic interventions, extended vocal techniques, physical movement, and her unusual electronic manipulation of the flute. She has toured extensively both nationally and internationally with performances at the Museum of Contemporary Art in Chicago, MoMA PS1, Roulette Intermedium in Brooklyn, and ISSUE Project Room. CAMERON SHAFII is an Iranian composer practicing electronic and electroacoustic music. His compositions are inflected with a host of digital synthesis processes and are informed by aspects of acousmatic theory, particularly spectromorphology. NITIN MUKUL is an artist based in NYC whose work bridges the mediums of painting and video. He has lived and worked in New York, D.C., New Delhi and Los Angeles and was a studio assistant to Sol LeWitt. He has shown with Nature Morte, Poetic Research Bureau, Aicon, The Guild, The Queens Museum and The Rubin Museum among others.